The Advisory Committee for Scotland (ACS) discusses a wide range of questions each year as part of its regular advice to Ofcom. When Ofcom’s annual Communications Market Report (CMR) on Scotland is being compiled, we always comment on the findings before they become public. Now that the CMR for Scotland been published, it’s worth highlighting a few key issues. Back in 2007, it was a marked fall in expenditure on TV production in Scotland that led to the setting up of the Scottish Broadcasting Commission by the First Minister, Alex Salmond. This body initially reported in 2008, and then in subsequent follows-ups. One notable effect of its recommendations was an increase in BBC network production in Scotland. More fundamental, perhaps, was the way in which the future of broadcasting was argued onto the Scottish political agenda by the SNP government, a line contested by Westminster (and by the unionist parties in the Scottish Parliament) because control over broadcasting is a ‘reserved’ power under the Scotland Act 1998. The CMR 2013 (p.52) shows that ‘the BBC and STV’s spend on news for viewers in Scotland has decreased by 13% since 2011 and by almost a third since 2007. Over the five-year period Scotland’s spend on non-news/non-current affairs was the least affected across the nations: the UK had an average decline of 43% compared to the 27% decline in Scotland.’ However, current affairs expenditure has increased by 6% against a UK decline of 28%. Any talk of decline normally produces political criticism but that has been muted this year. That is probably because there is a longer-term game in play. As we await the referendum on independence in September 2014, we may expect a new round of debate on the scope and scale of TV production in Scotland. The practicalities of what production is feasible under precisely what kind of funding regime will presumably be aired in the Scottish Government’s forthcoming white paper. However the arguments are put, Ofcom’s evidence points to the continuing centrality of television viewing to the lives of Scots, at 4.3 hours per day more than anywhere else in the UK (p.47). 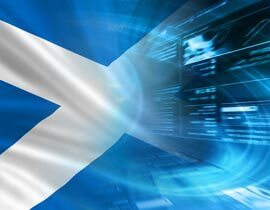 ACS has been particularly exercised about broadband access to the internet and the continuing digital divide in Scotland. Glasgow, the country’s largest city, remains an outlier relative to other cities in Scotland and the UK generally, and the low take-up there impacts on Scotland as a whole. Only fifty percent of adults in the City of Glasgow have fixed broadband compared to a Scottish average of 68% and the 77% GB average. The CMR addresses the available data in some detail (see pp.22-35) and also notes the effort made to try and understand this question in response to persistent questioning, not least from ACS. Comparative data show that Glasgow has the most unusual big-city demographic profile in the UK, with 60% of the population classified as ‘hard-pressed’, a euphemism for poor. There is some evidence that fixed broadband take-up is now finally increasing and that younger groups – the under 35s – are increasingly accessing the internet via mobiles. But progress is slow. ACS will continue to focus on this question because it has major implications for how communications enable citizenship as well as consumption. Universal access has become a precondition for equality of opportunity, distant as we are from that prospect. We have also been very concerned about access to mobile telephony by those living in rural areas, given its importance for the quality and sustainability of rural living. The costs of phone contracts are of notable importance in Scotland compared to other parts of the UK, as is the ability to make and receive calls at home. Quality of service – an issue that preoccupies all users across the UK – has also been on our agenda. Experience here has been broadly in line with the rest of the UK – which is to say, more variable than most actually find acceptable.